6/30 Cup of Coffee: The Sea Dogs rallied with the help of Garin Cecchini, Brandon Jacobs (pictured) hit a two-out, walk-off home run to send the Salem fans home happy for the second straight night, and Mookie Betts got his average back over .300. Lowell's pitching dazzled again, and the GCL Red Sox were able to come from behind for a walk-off win of their own. It was a rough game for PawSox pitching, as the Scranton/Wilkes-Barre RailRiders (NYY) cruised to a 12-4 victory. Chris Hernandez was hit hard, allowing 12 hits in four innings, as the RailRiders scored eight times before he was pulled from the game. 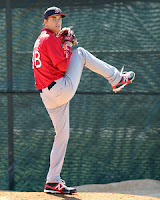 Chris Carpenter was not much better in relief, allowing four runs on four hits in two innings of work. 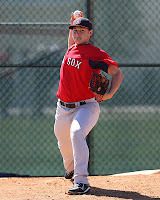 The Red Sox announced that they have officially signed second-round pick Teddy Stankiewicz, and Alex Speier of WEEI.com reported that right-hander Noe Ramirez (pictured) has been promoted from Salem to Portland. Stankiewicz agreed to terms shortly after the draft, but it took almost three weeks for the deal to become official. Rob Bradford of WEEI.com tweeted yesterday that Stankiewicz was waiting for clearance after his physical. He is in Lowell and should be pitching for the Spinners shortly. With Stephen Drew likely out a few more games, the Red Sox have called up Jonathan Diaz (pictured) to fill the void on the left side of the infield. To make room for Diaz on the 40-man roster, Clayton Mortensen was designated for assignment. Diaz is in today's starting lineup, batting ninth and playing third base. Diaz was signed as a minor league free agent in December of 2012 after spending the previous seven seasons in the Toronto Blue Jays organization. 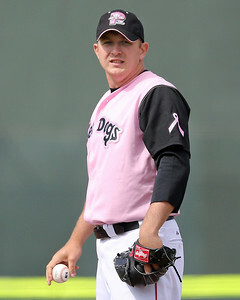 Drafted in the 12th round of the 2006 draft out of North Carolina State, Diaz first reached Triple-A in 2009, and has bounced around the upper minors every season since then. This is Diaz's first major league call-up. His familiarity with John Farrell and the rest of the coaching staff from his days with Toronto may have helped him get the call over Drew Sutton, who has major league experience. The Red Sox have announced the signing of 17th-round draft pick Joseph Monge, and also made official the signing of 16th-rounder Jalen Williams, whose signing was reported previously. Jim Callis of Baseball America reports that Williams' deal is for $150,000. Drafted out of the Carlos Beltran Academy in Puerto Rico, Monge stands at six foot tall and weighs 170 lbs. According to MLB.com, he profiles as an above-average defensive center fielder, while Perfect Game noted a plus arm, great quickness and good bat speed. No bonus number has been reported, but Monge has no college commitment, so it is unlikely to be above the $100,000 slot that would count against the Red Sox bonus pool. The Red Sox continued to lock down draftees, including third-round selection Jon Denney and sixth-round pick Jordon Austin. Denny, who signed for $875,000, was ranked the 25th best prospect in the draft by Baseball America. Jim Callis of Baseball America reported this morning that the Red Sox had signed 16th round selection RHP Jalen Williams for $150,000. The Providence Journal's Tim Britton sat down with PawSox manager Gary DiSarcina and shortstop Xander Bogaerts to discuss the 20-year-old's smooth progression to Triple-A with the glove. Bogaerts and former Portland teammate Anthony Ranaudo were both named to the 2013 Futures Game. Sea Dogs infielder Garin Cecchini is one of the finalists to be added to the roster via fan voting. 6/28 Cup of Coffee: Pitching ruled the day for Pawtucket and the GCL Red Sox, both of whom came away with shutout wins, while it was Greenville's bats that led the Drive. Portland failed to hold a late lead, as Salem and Lowell struggled out of the gate. 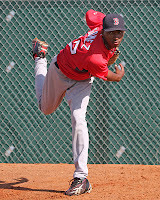 Rubby De La Rosa (pictured) continued to roll, as Pawtucket defeated the Toledo Mud Hens, 3-0. De La Rosa threw 5 2/3 shutout innings, allowing six hits and striking out six, while not walking a batter. The right-hander now has a scoreless streak of 20 1/3 innings. De La Rosa's ERA for the season is an excellent 2.28 and since April 23 is a phenomenal 0.74. 6/27 Cup of Coffee: Despite the weather putting a damper on the Sea Dogs and GCL Red Sox’s days, Wednesday was quite successful for the rest of the farm system. The teams that did play took four out of a possible five games, with the PawSox and Drive staging some late-inning dramatics to nab come-from-behind wins. Circumstances were looking bleak for the Pawtucket Red Sox against the Toledo Mud Hens (DET) when they were down 4-0 and batting with one out in the bottom of the seventh. Six consecutive hits later, however, the PawSox took a one-run lead, and right-hander Chris Martin threw two shutout innings to secure the 5-4 win. 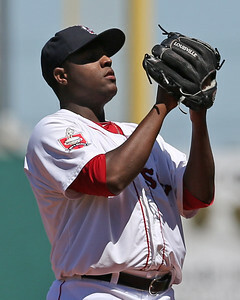 In what was a strong week overall for pitching among the nominees for SoxProspects.com Pitcher of the Week, Pawtucket's Rubby De La Rosa distinguished himself by working 11.1 shutout innings, while on the other side of the coin Portland's Tony Thomas distinguished himself as the class of a relatively week Player of the Week field. At Columbus (Indians) June 17, De la Rosa logged 5.1 innings, two hits, issuing five bases on balls and striking out five opposing batters, en route to earning the win. It was in his second start of the period, June 22 at Toledo (Tigers) that De la Rosa truly distinguished himself, allowing one hit, while striking out seven and walking none in a no-decision. De la Rosa owns a 1-1 record with a 2.54 ERA in 13 starts in 2013, having allowed 14 earned runs of 28 hits over 49.2 innings pitched, striking out 50 while and holding opponents to an .166 average. 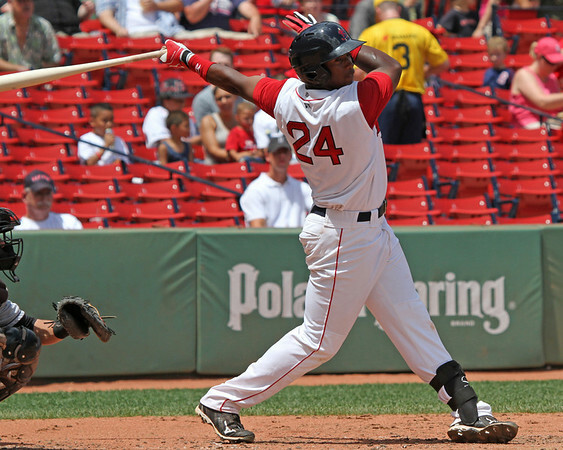 Major League Baseball has announced the rosters for the 2013 Futures Game, and a pair of Red Sox farmhands have been named. Shortstop Xander Bogaerts is on the World Team for the second straight season, while right-hander Anthony Ranaudo (pictured) has made the US Team. Additionally, third baseman Garin Cecchini has been chosen as one of five finalists in a fan vote for the last spot on the US Team roster. The Futures Game will take place at 2:00 pm on Sunday, July 14, as part of Major League Baseball's All-Star celebration at Citi Field in New York. 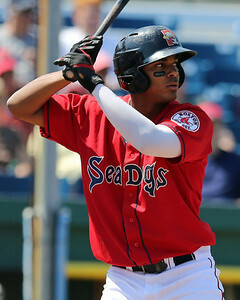 Bogaerts was promoted to Triple-A Pawtucket two weeks ago after an impressive performance at Double-A Portland. Across the two levels, the 20-year-old has compiled a .296/.389/.498 slash line with 10 home runs and a career-high six stolen bases. It is the second appearance in the Futures Game for Bogaerts, who went 1 for 4 with a base hit off Mariners prospect Danny Hultzen as the starting designated hitter for the World Team. 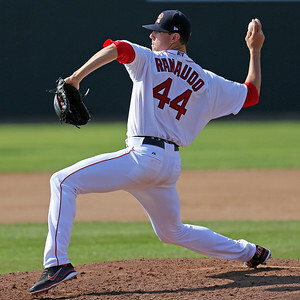 Ranaudo, 23, has had a strong bounce back season with Portland after struggling with injuries and inconsistency in 2012. The 2010 first-round draft pick out of LSU is 7-2 with a 2.28 ERA, and 0.975 WHIP. In 79 innings, Ranaudo has compiled 86 strikeouts, good for second in the Eastern League. Cecchini was promoted to Portland from High A Salem following that league's All-Star Game on June 18. At the time of his promotion, the third baseman was leading the Carolina League in batting average (.350), on-base percentage (.469), and bases on balls (43). Since joining the Sea Dogs, Cecchini has barely missed a beat, going 5 for 16 with three walks in his first four games. Several players currently in the Red Sox organization have been named to the Futures Game. Pitcher Matt Barnes joined Bogaerts at the 2012 game in Kansas City, and in years past, Will Middlebrooks (2011), Junichi Tazawa (2009), Jacoby Ellsbury (2005), and Clay Buchholz (2005) participated in the annual precursor to the Mid-Summer Classic. Four Sea Dogs were named Eastern League all-stars Tuesday, and there is a good chance none of them will surprise you. Right-hander Anthony Ranaudo, left-hander Drake Britton, corner infielder Michael Almanzar and catcher Christian Vazquez will represent Portland and the Eastern Division at the July 10 All-Star Game in New Britain, Conn., according to a team release. Ranaduo and Almanzar got in on the fan fate. Britton and Vazquez were selected by a combination of media, team personnel and Eastern League staff. A quick note before we get started: With Lowell starting off their season last week, the Scouting Scratch will typically run every Wednesday for the rest of the summer. This year’s Lowell roster has plenty of interesting prospects, especially in the starting rotation. This week I take a look at two of the younger players on this year’s team, and I’ll be keeping my eye on both of them as the season progresses. 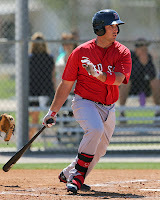 - Selected in the second round of the 2012 Draft, Jamie Callahan (pictured) was the youngest player taken by the Red Sox last year and got a few innings in the GCL at the end of the season. My first look at him came during the Fall Instructional League, where I saw him throw a couple of innings against the Rays Instructional Team. When I saw him in Lowell recently, it was the first time I had seen him throw an extended outing. It was immediately clear that his raw stuff had taken a step forward since last year. During Instructs, Callahan sat 90-92 mph, but in his first inning with Lowell, Callahan was throwing much harder, at 92-93 mph, and touching 94 and 95 once each. He recorded one strikeout that inning on a good 92-mph fastball away from a right-handed hitter. In the second inning, Callahan held his velocity, sitting 92-93 again, but as his pitch count increased, he lost a bit of life and by the third inning he was more 90-91. Over his final three innings, he topped out at 92 twice and 93 once. This was only his first start in game action, thus the velocity drop isn’t something to worry about at this point, but with his mechanics, it is something worth tracking as I see him more this season. 6/26 Cup of Coffee: It was a strong night on the farm, as a combination of good pitching and great hitting allowed the affiliates to win four of the five games played on Tuesday. Young stars Xander Bogaerts and Henry Owens (pictured) stood out, while Brandon Workman continued to carve up the International League. Behind another strong start from Brandon Workman, the PawSox pummeled the Toledo Mud Hens (DET), 16-3. Workman went the first six innings, allowing two runs on seven hits, while walking one and striking out five. Workman has been a model of consistency this year. He has not allowed more than three runs in any of his last eight starts, including his first four in Triple-A. Well, a little over a year after the "forgot to hit record" incident, Chris screwed up and deleted the audio from the second half of last week's podcast. However, he made up for it by recording a new episode with Ian Cundall, going over the news--including Will Middlebrooks' demotion, Garin Cecchini's promotion, and Trey Ball's signing--before delving into the players to watch in Lowell and the GCL this year. Also, Chris sneezes really loudly during the middle and leaves it in to show he's a good sport. The Red Sox today optioned third baseman Will Middlebrooks to Triple-A Pawucket and recalled infielder Brandon Snyder. To make room on the 40-man roster for Snyder, the team moved catcher David Ross to the 60-day disabled list. Middlebrooks, who started the season as the team's starting third baseman, has struggled at the plate in 2013, hitting just .192/.228/.389 with nine home runs and 25 RBI. The 24-year-old has been losing playing time to Jose Iglesias, who has been impressive on the field and at the plate, hitting .419/.493/.581 with a home run and four RBI in 19 games this month. The move cements Iglesias as the team's starting third baseman, and gives Middlebrooks the opportunity to get regular at-bats and get on track in Pawtucket. 6/25 Cup of Coffee: While the major-league club had the night off, it was a busy day down on the farm. Pawtucket and Greenville came out on top of back-and-forth contests, while Lowell and the DSL Red Sox used dominant pitching performances in their wins. Portland could not get its bats going, costly errors hurt Salem, and a GCL Red Sox comeback bid fell short. Pawtucket won its third straight, a 5-4 victory over the Toledo Mud Hens (DET). Continuing his rehab assignment, Clayton Mortensen pitched a scoreless first inning, striking out one and allowing a base hit. Chris Hernandez followed and struggled with his control, walking five in two innings, while giving up a pair of runs on just one hit. The control problems have been a recent trend for the left-hander, who now has 12 walks in 15 innings across five June appearances. Terry Doyle picked up the win in relief, allowing one run on one hit in 3 2/3 innings, striking out four and walking three. 2013 Annual Drive - Help Keep SoxProspects Free! We’re asking for your help to help raise $3,000 to help keep SoxProspects.com free for another year. We've kept the site 100% free to the public for just shy of ten years now, and we hope to do so for the foreseeable future. As you may have also noticed, we continue to expand and improve our content, including new features, everyday coverage, first-hand analysis, improved layouts, and a new forum host. Unfortunately, costs continue to pile up with these expanded features. As we've done over the past five seasons, we're reaching out to the community for donations to help keep the site free for everyone. Donations help cover site costs in two primary areas: (1) first-hand coverage costs for scouting and player columns; and (2) web hosting fees (including forum hosting costs). Your donations help us travel to Ft. Myers in the spring to cover spring training and in the fall to cover the Instructional League. They also help cover the costs of travelling to Pawtucket, Portland, Salem, Greenville, and Lowell games for scouting and first-hand coverage. In terms of web hosting costs, the site resides on four servers, each with their own set of annual fees. We anticipate that our costs in these two areas will exceed $10,000 in 2013. While we make limited funds from online advertising revenue, we simply don’t make enough to cover all of our costs. Nearly every new player that arrives in Portland manager Kevin Boles’ clubhouse does so after a spell of extended success in High A Salem. The latest in a line of top prospects to arrive from the Carolina League with a gaudy stat line and the accompanying prospect buzz is third baseman Garin Cecchini, who was promoted after an all-star first half, during which he hit .350/.469/.547 in 63 Carolina League games. For Cecchini to carry that success into the challenging Double-A Eastern League, Boles said the key would be to not let the new surroundings or higher competition change his approach. 6/24 Cup of Coffee: Pawtucket and Portland both easily obtained victories Sunday afternoon thanks to strong performances at the plate and on the mound. Salem held on for a close victory while Greenville and Lowell both had unimpressive days at the plate. A 12-hit offensive charge plus eight solid innings from Alfredo Aceves propelled Pawtucket to a 7-2 victory over the Toledo Mud Hens (DET). Aceves improved to 3-1, allowing a run on five hits and a walk while punching out seven. Chris Martin allowed a run on two hits in his lone inning of relief. 6/23 Cup of Coffee: Rubby De La Rosa (pictured) was almost perfect on Saturday, Salem continued to score runs in bunches, and Ty Buttrey had a less-than-stellar 2013 debut. The GCL Red Sox walked off with a win, while the DSL Red Sox were one-hit in a rare loss. It was a nail-biter in Toledo, as the PawSox escaped with a 5-4 victory over the Mud Hens (DET) in 10 innings. Rubby De La Rosa pitched the first six innings, allowing only one hit. He walked none and struck out seven while throwing 42 of his 63 pitches for strikes. He has allowed only four earned runs in his last 37 innings, good for a 0.97 ERA in that span. 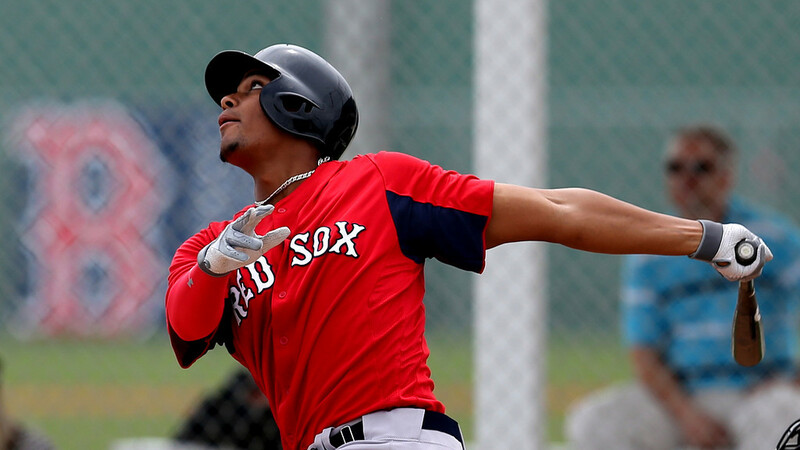 The Red Sox announced the signings of two more 2013 draft picks on Friday, sixth-round pick Jordon Austin (pictured), a high school outfielder from Florida, and 12th-round pick Jake Drehoff, a left-hander out of Southern Mississippi. In addition, the club officially signed its third-round pick, catcher Jon Denney. It had been previously reported that Denney had agreed to sign for $875,000. The release also announced the signings of Corey Littrell and Gabe Speier, which had become official on Thursday. 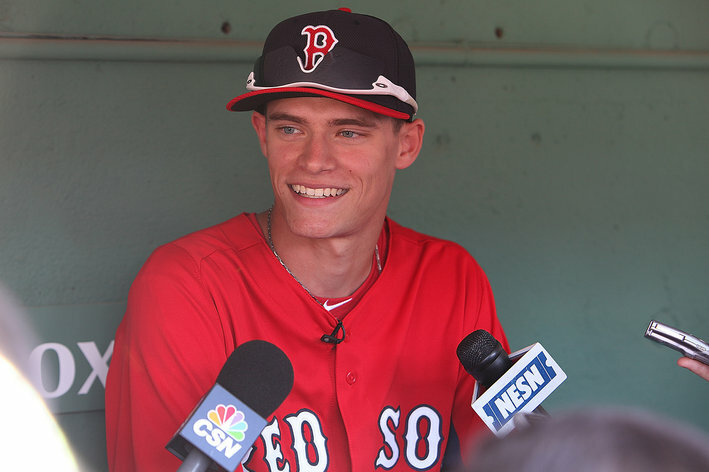 Austin was one of just three high school players selected by the Red Sox in the first 12 rounds. An excellent athlete, he received offers to play football in college as well, but was committed to Seminole State College (Fla.) to play baseball. He possesses a strong arm in the outfield and a short, hard swing at the plate. He will almost certainly report to the Gulf Coast League, about three hours down the Florida coast from his home in Ocala. 6/22 Cup of Coffee: In what ended up being a bit of a down day on the farm, Salem Red Sox outfielder Brandon Jacobs helped slug the team to victory, while all three other full-season affiliates took losses. The Lowell Spinners collected their third win of the season, the DSL Red Sox keep rolling and the GCL Red Sox lost their first game of the season. The International League North leading Pawtucket Red Sox could not add to their division lead Friday dropping their contest to the Toledo Mud Hens (DET) by a score of 8-5. The game featured late scoring from both sides as Pawtucket and Toledo scored a combined five runs in the final two frames. A bright spot for Pawtucket offensively was shortstop Xander Bogaerts, who collected his second home run as a member of the team to lead off the sixth inning. Catcher Dan Butler also went deep in the game, his fifth on the season. PawSox starter Stephen Wright was strong early but ended up giving up five runs, four earned, before leaving the game in the sixth inning. The knuckleballer logged 5 1/3 innings, walking five and striking out four. The Red Sox have set the roster for their Gulf Coast League affiliate, which opened play on Friday. The roster is highlighted by 2013 first-round draft choice Trey Ball. Other prominent players on the squad are shortstop Wendell Rijo out of the Dominican Republic, catcher Alixon Suarez and righty Keivin Heras from Venezeula, and Austrailan left-handed pitcher Daniel McGrath. The Opening-Day start on Friday afternoon will go to McGrath. The 6-foot-3 lefty, signed by Pacific scout Jon Deeble, impressed while playing in the Australian juniors, showcasing a fastball that touched the low-90s. On Wednesday, the Red Sox officially announced the signings of 11 draft picks, including first-round pick Trey Ball (pictured), who signed for roughly $500,000 under slot. Ball will report to the Gulf Coast Red Sox, which starts its season today. Prior to Boston's announcement, MassLive.com's Evan Drellich reported that the club agreed to terms with Jalen Willams and Danny Bethea, Alex Speier of WEEI.com reported the signings of Bryan Hudson and Jantzen Witte, and Jim Callis of Baseball America reported the signing of Jake Drehoff. 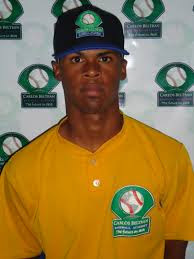 Yesterday, Callis reported the signing of Corey Littrell, whom the Red Sox selected in the fifth round. Boston has officially signed Littrell and 19th-rounder Gabe Speier this morning, per Alex Speier. Ball has been included in the our updated prospect rankings, which were first released by SoxProspects Editor in Chief Mike Andrews on ESPNBoston.com. In the piece, Andrews notes the top levels of the organization look stronger than they have since 2007, the year of Jacoby Ellsbury, Dustin Pedroia and Clay Buchholz. 6/21 Cup of Coffee: It was a night of highly-touted pitchers on the mound down on the farm, and they were led by the trio of Pawtucket arms who combined on a five-hit shutout. Portland cruised to victory, while the DSL Red Sox remained hot with a thrilling walk-off win. Lowell was handed its first loss of the year when it was on the wrong side of a comeback, and it was a rough night for Greenville. Pawtucket took a 3-0 victory over the Columbus Clippers (CLE) largely on the strength of an excellent outing by Brandon Workman. The 24-year-old right-hander continued to impress, pitching seven shutout innings, while allowing just four hits, walking two and striking out five. It is the second time this season that Workman has pitched at least seven scoreless frames, also doing so in April while with Double-A Portland. Clayton Mortensen followed, making his first rehab appearance, striking out one and walking one in a hitless eighth inning. Jeremy Kehrt allowed one hit and struck out one in a scoreless ninth to earn credit for his first save since 2011. The Red Sox have agreed to terms with fifth-round draft pick Corey Littrell, reports Jim Callis of Baseball America. Littrell, a 6-foot-3 left-hander out of the University of Kentucky will receive a $300,000 bonus, slightly under the recommended $340,700 slotted for his position. Littrell is considered to have advanced pitchability, and is also an excellent fielder, winning a Gold Glove in his sophomore year. That was his best season for the Wildcats, earning All-SEC honors with a 2.74 ERA and 87 strikeouts in 98 2/3 innings pitched. Littrell experienced a slight dip in his junior year with an ERA that rose to 3.72, allowing him to slip to the Red Sox in the fifth round. It’s hard to believe that we’re already at the halfway point of the 2013 minor league season. Now that Jose Iglesias has graduated from prospect status and Boston has officially signed 11 of its 2013 draft picks, it’s about time to take a fresh look at the top 10 prospects in the Red Sox system. The top levels of the system look stronger than they have since early 2007, when the farm included the likes of Jacoby Ellsbury, Clay Buchholz, Dustin Pedroia, Daniel Bard, Justin Masterson, Jed Lowrie, David Murphy, George Kottaras and Brandon Moss. However, the lower levels of the system are a bit more thin than in recent years, likely due to the new draft and international signing bonus caps. Third baseman Garin Cecchini has received a promotion to Double-A Portland, reports Alex Speier of WEEI.com. The promotion comes after a half season of dominating the High A Carolina League, earning All-Star recognition while hitting .350/.469/.547 in 63 games. 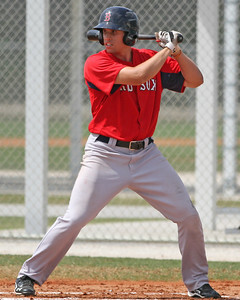 Cecchini, 22, has risen steadily through the Red Sox system since being drafted in the fourth round of the 2010 draft out of Alfred M. Barbe High School in Lake Charles, La. Showing an advanced approach from the start, he has been an All-Star at every level. In 2011, he got off to a .298/.398/.500 start at Lowell before suffering a season-ending wrist injury. Cecchini came back strong from that setback in 2012, hitting .305/.394/.433 with 38 doubles and 51 stolen bases for Greenville. 6/20 Cup of Coffee: While the PawSox and Sea Dogs ended up on opposite ends of their respective extra-inning games, the Lowell Spinners left no doubt, scoring early and often to nab their second win of the week to start their season. The PawSox fell behind 4-0 early, but chipped away and eventually came away with a 6-5 win over the Columbus Clippers (CLE) after catcher Dan Butler’s game-winning homer in the top of the 10th. Right-hander Terry Doyle was hit around in his four innings of work, giving up four runs on five hits and two walks. He also struck out five, while throwing 61 percent of his pitches for strikes. The Red Sox announced today that they have reached an agreement with their first-round pick, left-handed pitcher Trey Ball. Terms of the deal were not announced, although Ball will reportedly sign for below the $3.246-million slot value for the seventh overall pick, as first reported by WEEI.com's Alex Speier. UPDATE (4:47 PM): Speier is now reporting that Ball signed for $2.75 million, nearly $500,000 under slot. The Red Sox are now $648,600 under their allotted draft cap for signings that have been reported, and $990,110 under the cap plus five percent, the threshold the team may go to without forfeiting future draft picks. Widely considered the top two-way player in the draft, Ball played both outfield and pitched for New Castle (Ind.) Chrysler High School, but will pitch full time upon turning pro. 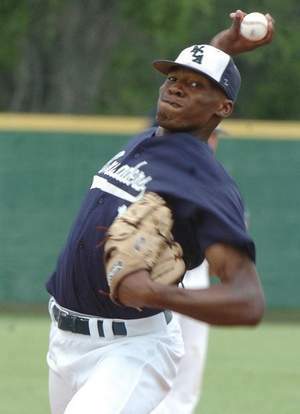 He had been committed to the University of Texas, but will opt to begin his professional career. Standing 6-foot-6, Ball has tremendous upside featuring a low to mid-90s fastball, a changeup with good arm speed and fade, and a developing curveball. Ball is only listed at 190 pounds and has lots of room to fill out, and potentially add velocity as he develops. He was ranked ninth on Baseball America's draft rankings, eighth on Keith Law's ESPN.com draft rankings, and 12th on Perfect Game's draft rankings. 6/19 Cup of Coffee: Pawtucket took advantage of some defensive miscues in a late victory, Portland split a doubleheader, and the GCL Red Sox rolled back into the win column. Lowell was postponed by rain, while a quintet of Salem and Greenville players saw All-Star action. A crazy ninth inning allowed Pawtucket to come away with a 3-2 win over the Columbus Clippers (CLE). Knotted at two going into the top of the inning, the PawSox were able to score the go-ahead run despite going 0 for 6 in the frame. With one away, Drew Sutton reached on an error by the third baseman and was forced out on a Mitch Maier grounder to second. Columbus then followed with two more errors, one fielding error on a grounder to second by Bryce Brentz, the next on a throwing miscue on a ball off the bat of Brandon Snyder. This series of mistakes allowed Maier to come around to score, giving Pawtucket the lead. This week's SoxProspects.com Player and Pitcher of the Week polls featured a pair of winners with wide margins of victory in Salem's Keury De La Cruz (73 percent) and Portland's Anthony Ranaudo (82 percent). De La Cruz batted .462/.500/.692 (12-for-26) with one home run and three doubles, scoring four runs and batting in eight. His best night of the period came against Lynchburg (Braves) June 14 when he went two-for-three with a home run. 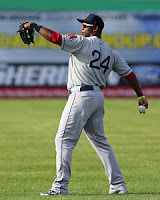 Through 68 games in 2013 De La Cruz, ranked twenty-third in the system by SoxProspects.com, is hitting .288/.317/.447 (76-for-264) with four home runs, 24 doubles, and three triples. The Red Sox have come to terms on an above-slot deal for left-handed pitcher Jake Drehoff, reports Jim Callis of Baseball America. The deal is for $175,000, and will count for $75,000 against the draft cap. As always, the deal is contingent upon the passage of a physical exam. Drehoff, a 12th-round choice out of Southern Mississippi, tossed a 3.54 ERA in 81 1/3 innings across 15 starts. He consideres his changeup his best pitch, according to Michael Periatt of MLB.com. Per Callis, he throws his fastball in the 87 to 91 range, and supplements that with a slider. Right-handed reliever J.B. Wendelken has been added to the South Atlantic League All-Star roster, reports Frank Sulkowski of WJCL, the Georgia coast's ABC affiliate. Wendelken joins Greenville Drive teammates Mookie Betts and David Chester on the Southern Division squad. Wendelken, a 13th-round draft choice in 2012, has been one of the bright spots on the Greenville pitching staff. The 20-year-old has compiled a 2.94 ERA in 49 innings across 16 appearances, all in relief. Wendelken has struck out 39 while walking 19, and leads the Drive with four saves. Add Bryan Hudson and Jantzen Witte to the list of players who are making their professional baseball dreams come true. Alex Speier of WEEI.com reports that the Red Sox have signed both Hudson, a 15th-round outfielder out of Mill Creek HS (Ga.), and Witte (pictured), a third baseman selected in the 24th round out of Texas Christian University, bringing the total number of Sox draftees signed to 14. Hudson was the third outfielder drafted by the Red Sox this season, behind Jordon Austin (sixth round) and Forrestt Allday (eighth round). At 6-foot-1, 185 pounds, Hudson has a projectable body, but his biggest weapon is his speed, which grades as a 70 on the 20-80 scale, according to Speier. 6/18 Cup of Coffee: While there were only three games on the schedule, Monday saw plenty of action down on the farm. The Spinners kicked off their season with a thrilling ninth-inning victory, as a trio of arms combined for a 15-strikeout shutout. Not to be outdone, a trio of PawSox hurlers delivered a three-hit shutout. The lone loss on the night came from the DSL squad, only the team's third defeat on the season. 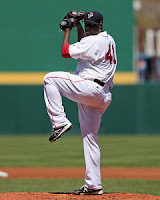 Pawtucket notched just six hits, but it was more than enough offense in a 4-0 victory over the Columbus Clippers (CLE). Making his first appearance since his short re-call to the major-league club, Rubby De La Rosa struggled some with his control, but Clipper bats struggled even more to make contact. The right-hander allowed only two hits in 5 1/3 shutout frames, walking and striking out five apiece. Alex Wilson, also making his first appearance since a short Boston stint, followed De La Rosa. Wilson allowed just one hit in his 1 2/3 innings, striking out three of the six batters he faced and firing 19 of his 25 pitches for strikes. Brock Huntzinger finished with two perfect innings, striking out one. Every Monday during the season we will feature a video here from the SoxProspects YouTube page. Today's video is of seven young hitters who have yet to make their Double-A debuts, from spring training this year. In it, you can see Sean Coyle, Brandon Jacobs, Henry Ramos, Keury De La Cruz, Williams Jerez, Cody Koback, and Kendrick Perkins take turns batting in game action against Baltimore, Tampa Bay, and Minnesota affiliates. Follow the link to the YouTube page to view many other prospect videos. With Chris Mellen back from his yearly southern swing, the two unofficial members of SoxProspects South, Chris Hatfield and Jon Meoli, hit him with some questions about the players he saw at the two full-season A-ball affiliates. The guys also talked about Xander Bogaerts's promotion to Pawtucket, Jon Denney signing for way less than we thought he would, and the rest of the news. In each of the last four years, several readers made donations ranging from $5 to $200 to help defray these costs. Thanks so much to everyone who chipped in! One thing I’d like to note is that while we've remained free, other similar baseball sites charge for content. For example, Scout.com costs $90 per year, Baseball America charges $66 per year, and Baseball Prospectus costs $39.95 per year. I think those sites are great in their own right, and are absolutely worthy of subscriptions. I’d also like to think we’d be worthy of comparable rates if we ever decide to go that route, but we've decided that we want to keep the site free for as long as we can. Donations from regular readers go a long way towards making that happen. Ultimately, through draft signing season, we are asking our readers to donate what they can to help keep SoxProspects.com free to the public. If you want to donate, first, we would like to thank you profusely – it’s truly appreciated. To donate, visit our DONATIONS PAGE. All payments are secured through PayPal, although you don’t need a PayPal account to contribute. All of the donations will go directly to our costs – none of the owners have taken out a dollar of profit out of the site's tills over the last six years (obviously we’re not doing this to get rich!). Last, to any of our regular readers that are not members of the SoxProspects Forum, please sign up! We’d love to get some new members in on the discussion and some new ideas floated around during our peak season! And to all of our current forum members out there, don’t be afraid to start new discussion threads – especially threads on specific players. It would be great to get more player-centric discussion going on the board in addition to the other topics already being discussed. As always, thanks to all of our readers for visiting the site and all of our forum members for posting! 6/17 Cup of Coffee: Pawtucket and Portland used strong starting pitching to cruise to victories on Sunday. In other action, Salem split a doubleheader against Lynchburg, and Greenville lost its sixth straight game, as the Drive head to the All-Star break. 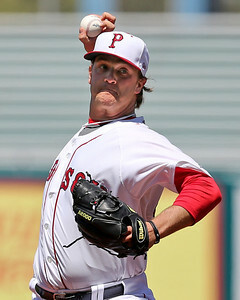 Stephen Wright's gem led Pawtucket to a 5-3 victory over the Buffalo Bisons (TOR). The knuckleballer tossed eight innings, allowing one run on five hits, while striking out seven. 6/16 Cup of Coffee: Brandon Workman showed swing and miss stuff in Pawtucket, Michael Almanzar, Blake Swihart (pictured) and Garin Cecchini stayed hot, and the DSL Red Sox continued to roll. Xander Bogaerts did show that he is human in a Pawtucket loss. 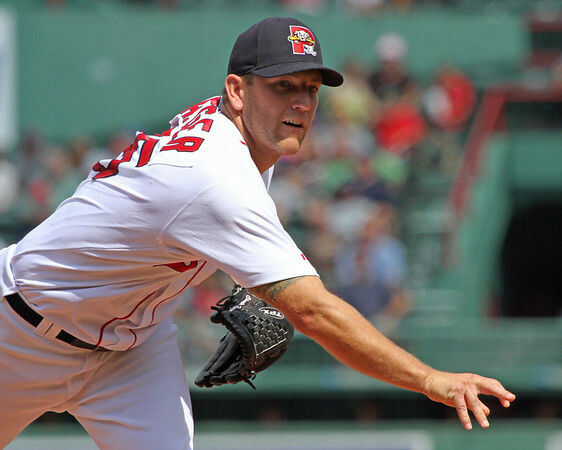 Despite a strong start from Brandon Workman, the PawSox fell to the Buffalo Bisons (TOR), 2-1. Workman allowed two runs, one earned, in 6 1/3 innings, walking three and striking out nine. He induced 15 swings and misses, and a second inning home run was his only real blemish. Ryan Rowland-Smith was once again dominant in relief, and Brock Huntzinger pitched a scoreless inning in his first game with the PawSox after being promoted. Evan Drellich of MassLive.com is reporting that the Red Sox have agreed to terms with 16th-round pick Jalen Williams (pictured) and 34th-rounder Danny Bethea. The exact terms are not yet known, but Drellich stated that the deal for Williams is "slightly-above slot." Drellich later reported that first-round pick Trey Ball is flying to Boston on Sunday, presumably to take a physical. Ball's deal is still expected to be below the slot value of $3,246,000 for the seventh pick. Williams is a three-sport athlete from Westminister Christian Academy (LA) who was committed to play wide receiver at Nichols State this fall. The 6-foot-3, 200-pound right-hander was rated as the 352nd-best prospect in the draft according to Baseball America. He is very raw, as he has never focused solely on baseball, and he features a low-90s fastball with an inconsistent changeup and breaking ball. The Red Sox are dreaming on his athleticism, as he is a player who will require significant development time. 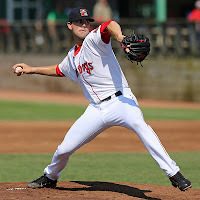 According to Kevin Thomas of the Portland Press Herald, Portland Sea Dogs right-hander Brock Huntzinger (pictured) has been promoted to Pawtucket and Portland has recieved Salem Red Sox righty Michael McCarthy to start tonight's contest against the Akron Aeros. A corresponding move will be made by Pawtucket in order to place Huntzinger on the roster, which is currently at it's limit of 25 players. Huntzinger pitched 31 innings over 25 appearances of the Portland's bullpen this season while striking out 25, walking 12 and notching a system-high 13 saves. The 24-year-old earns his second promotion to Triple-A, as he surrendered two runs and struck out four over three innings with the PawSox last season after 71 innings in Portland in which he walked 24 and struck out 55. PAWTUCKET, R.I. - There were 8,976 eager fans at McCoy Stadium on Friday with high expectations for top prospect Xander Bogaerts, who was making his debut with Pawtucket in its doubleheader against the Buffalo Bisons after he was promoted to the club on Thursday. Playing as the second youngest position player to ever don a PawSox uniform, Bogaerts finished the day 3 for 7 with a single, walk, two strikeouts, a stolen base, and a two-run home run that was inches away from clearing the entire stadium. 6/15 Cup of Coffee: The Pawtucket Red Sox produced back-to-back walk-off wins in a doubleheader led by a cast that included newly promoted shortstop Xander Bogaerts (pictured), while Salem split its doubleheader Friday. Greenville and Portland fell by a combined four runs, and the DSL Red Sox continued their hot start. Friday's doubleheader against the Buffalo Bisons (TOR) at McCoy Stadium had no shortage of story lines, as two late-inning singles led to back-to-back walk-off wins for the PawSox, who won 1-0 in the first contest and 8-7 in the second. With two outs in the bottom of the seventh, Bogaerts stepped up to the plate for only the third time in his International League career. The Aruban rolled a groundball single down the left field line for his first Triple-A hit, then stole second base to set the stage for left fielder Alex Hassan, who won the game with a single to left field. According to Jim Callis of Baseball America, the Red Sox have agreed to terms with third-round pick Jon Denney. Callis reports that Denney would receive an $875,000 signing bonus, well below what some projections thought it would take to sign Denney out of his commitment to Arkansas. Denney was thought to be a day-one talent entering the draft, ranked among the top 25 players available by both Baseball America and Perfect Game. It was thought that he fell in part due to signability, but at the number he signed for, perhaps teams had inaccurate information regarding the bonus he would sign for. The $875,000 figure is $203,800 higher than slot value for the 81st pick, where he was selected, but given that some projections estimated it may take as much as $1.5 million to sign him, he represents an outstanding value given where he was selected. The Red Sox have added PawSox starter Rubby De La Rosa to their roster for tonight's contest against the Baltimore Orioles, according to multiple outlets. The move was first reported by Tim Britton of the Providence Journal. For the countermove, Boston optioned right-hander Alex Wilson to Pawtucket, per WEEI's Alex Speier. De La Rosa, acquired in last season's blockbuster trade with the Dodgers, had a 3.29 ERA with 38 strikeouts and 20 walks over 38 1/3 innings (11 starts) with Pawtucket. The 24-year-old initially struggled when he was on his 50-pitch limit, allowing 10 runs while walking six in his first 6 2/3 innings of the season. But once the limit gradually increased, De La Rosa found his form as he didn't allow an earned run from April 27 to May 23, a span that stretched 20 2/3 innings. He struck out 31 batters in his last 31 2/3 innings pitched with Pawtucket while walking 14 and allowing just four earned runs. He topped out at 83 pitches on June 2 in his start against the Syracuse Chiefs. 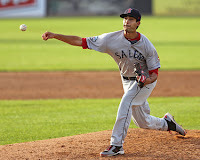 6/14 Cup of Coffee: Xander Bogaerts’ Triple-A debut got rained out, as did Salem’s doubleheader, but right-hander Anthony Ranaudo (pictured) was nothing short of dominant in Portland, fanning 13 batters to tie a franchise record last accomplished by Jon Lester in 2005. The Sea Dogs, powered by Ranaudo’s 7 2/3 sparkling innings, shut out the Erie SeaWolves (DET), 2-0, in their first game without Bogaerts. The Red Sox have agreed to contract terms with six more selections from the 2013 draft. Among the signings are the Red Sox eight, ninth and tenth round selections, which include center fielder Forrestt Allday, right-handed pitcher Kyle Martin and right-handed pitcher Taylor Grover, respectively. 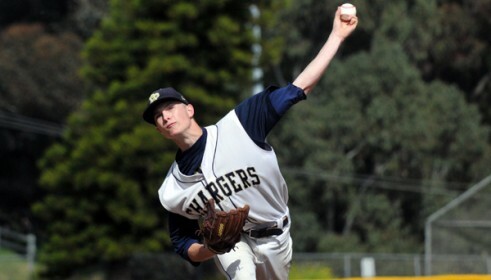 According to Baseball America, the team has also signed left-handed pitcher Gabe Speier (pictured), who was selected in the 19th round out of Dos Pueblos High School in California, Jake Romanski, a catcher out of San Diego State University, and second baseman Reed Gragani, the team's 21st round pick. 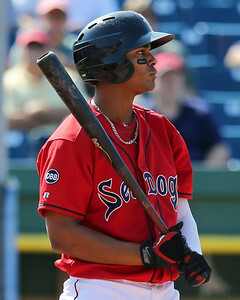 PAWTUCKET, R.I. - Xander Bogaerts wasn't expecting a promotion to Triple-A, but shortly after the Sea Dogs' doubleheader on Wednesday night the 20-year-old received the news to pack his bags for a trip to join the International League North leaders in Pawtucket. “Oh man, special," Bogaerts said when asked his reaction to the promotion. "I know I've been playing great baseball [in Portland] and I was happy to be called up. Everyone wants to get called up when the season begins, so I was happy with the way things were going. I didn't expect it, to be honest. After a long day [with the doubleheader], what a way to make your day. It was nice day to pick." You may have noticed that the Twitter feed that usually resides on many of the site's main pages stopped working yesterday, and has since been removed. This is because of a technical issue on Twitter's side -- for the technically inclined, Twitter retired API feeds, which we used for the site widget. We're working on finding a replacement, but it may be a few days, so please bear with us. In the meantime, allow me to suggest any of you who are still Twitter-resistant to consider signing up. It's not just 16-year-olds posting about their breakfast -- used properly, it really is a great news tool. 6/13 Cup of Coffee: It was an ugly night for the farm system, with only the DSL Red Sox adding to the win column. Salem and Greenville had plenty of hits, but pitching did them in, while Portland could hardly buy a run in support of its strong pitching. The Sea Dogs ended up on the wrong end of a doubleheader sweep. After a soggy Tuesday, the Sea Dogs played two and lost two to the Erie SeaWolves (DET) at home, collecting a combined three runs and eight hits during a 3-2, extra-inning loss in game one, followed by a 1-0 loss in game two. Portland’s only two runs in the opener came courtesy of a Xander Bogaerts line-drive single to center in the sixth inning, scoring second baseman Heiker Meneses and center fielder Shannon Wilkerson. Salem's Henry Ramos powered himself to SoxProspects.com Player of the Week honors with three home runs and two doubles last week, while posting a .417/.500/.875 batting line, knocking in eight runs, and swiping three bags on the basepath. Not to be outdone, Portland's Drake Britton worked eight innings of shutout, one-hit ball striking out eight while walking only one at Erie (Tigers) June 5, en route to earning the nod as SoxProspects.com Pitcher of the Week as well as Eastern League Pitcher of the Week. 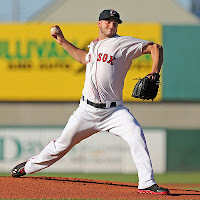 Britton, the fifteenth-ranked prospect in the system by SoxProspects.com, owns a 5-5 record and 3.25 ERA, having allowed 39 runs, 26 earned, on 69 hits for a .249 opponents' average, over 72 innings pitched in 13 starts. On the season Ramos is hitting .259/.354/.425 (50 for 193) with seven home runs, seven doubles and two triples. - For the first month or so of the season, Xander Bogaerts (pictured) was hitting the ball well in Portland, but the power wasn’t there. As the weather has warmed, however, his power has returned. During a recent scouting look, Bogaerts showed why his power consistently grades 65-to-better on the 20-to-80 scouting scale. Bogaerts has elite bat speed and the ball jumps off his bat. He generates great lift with an effortless swing and can drive the ball to all fields. This ability to work to all fields was on display within a single game recently when he homered twice, once to center field and then to left field, before doubling to right-center in his final at-bat.